I'm being distracted from my card making and paper crafts by discovering and exploring some wonderful sites. I'm into Vintage and Shabby Chic at the moment, so was delighted to come across Miss Gracie's House. Rene has the most elegant things to share and now she has an Etsy shop too. Check it out at My Vintage Romance... gorgeous! But to celebrate 300 posts, she's decided to have a giveaway. And what a giveaway it is... think style, class and the elegance of times past. There's even a vintage wooden box, plate and yes... chocs... what more could you want. This is something special. 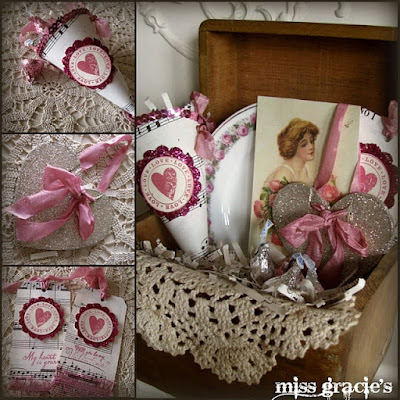 Head on over to Miss Gracie's House for all the details. Closes February 1st.